The name of this Usecase. Will not appear in the game. All actions that you have created in this Adventure. Selecting one of these actions will place it in the Triggered Actions for this Usecase. The actions that you have chosen to be triggered when this UseCase is activated. 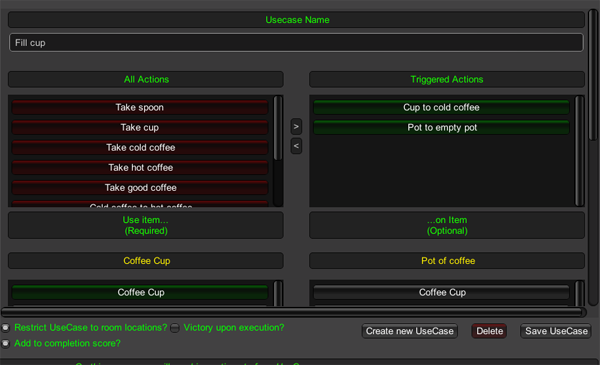 Selecting one of these actions will remove it from the Triggered Actions for this Usecase. The item targeted by this Usecase. Drawn from a list of all items that you have created in this Adventure. The item with which to use the Use Item. The accepted keywords that will trigger this usecase. The description printed when this UseCase is triggered. Example: "You hit the teapot with the hammer. It smashes into a billion tiny foot-cutting shards of ceramic. Congratulations; you've destroyed something beautiful"
A list of all rooms that you have created in this Adventure. Selecting a room in this list will add it to the Allowed Use Locations for this Usecase. This option is only available when "Restrict usecase to room locations" is true. A list of all rooms in which this usecase may be triggered. If "Inventory" is in this list, the target item must be contained in the inventory. Restrict Usecase to Room locations? 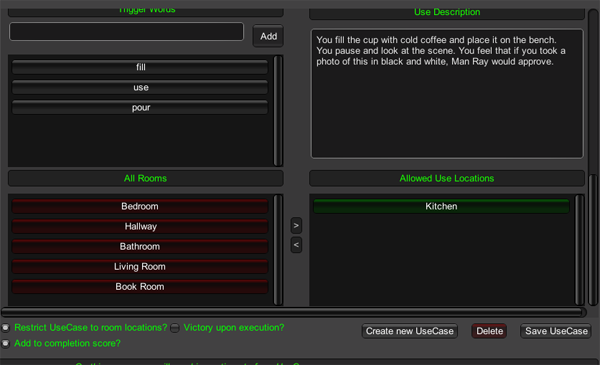 If selected, this usecase may only be triggered in the specified rooms. Does this usecase end the adventure? 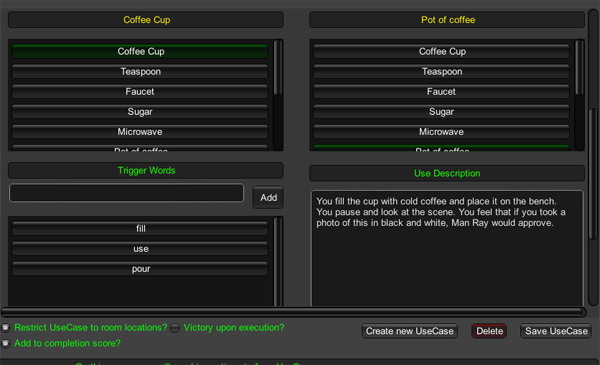 Can be used to 'kill' the player, or to allow them to 'win'. Does this usecase count toward the maximum points available to be earned in this Adventure? If true, this will increment the maximum earn-able points, and when triggered - will increment the current points (only once per usecase).